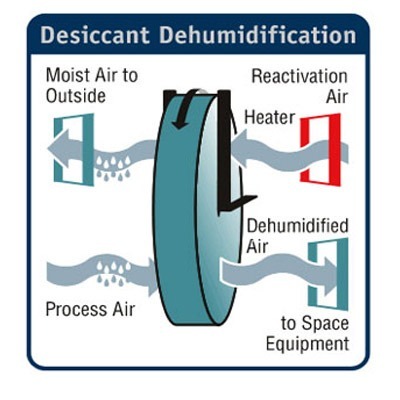 A Desiccant Dehumidification system consists of a desiccant wheel which rotates through a supply and regeneration air stream. In the supply air side the desiccant wheel removes moisture from the air stream by absorption. As it rotates into the regeneration air stream it is subjected to hot air. This hot air absorbs the moisture picked up on the supply side and exhausts it to atmosphere. We can utilize resistance electrical heaters, Direct or Indirect fired Natural Gas, or Steam as the regeneration heat medium. All the heat from the regeneration side of the process does not get exhausted to atmosphere. As the hot desiccant media rotates into the supply side air stream unwanted heat is put into that air stream. 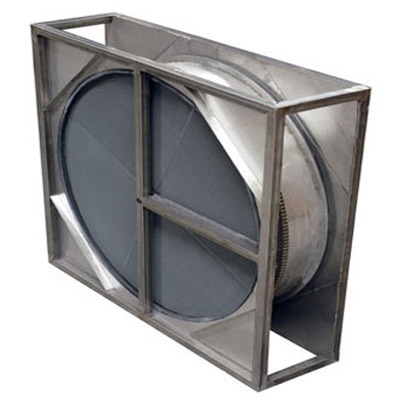 Depending on the humidity levels and the quantity of outside air required the use of a refrigeration pre-cooling coil may be required. The purpose of this coil is to remove as much moisture as possible before the desiccant dehumidifier. PPS Silica Gel is used in most environments and desiccant cooling applications. PPM Molecular Sieve is used when the inlet air is either hot or alkaline, or a low dew point is required. PPH Hygienic is used where enhanced bacteriostatic properties are desire. This is typically a very good application for sensible heat recovery. If the air can not be exhausted a post-cooling coil may be required.